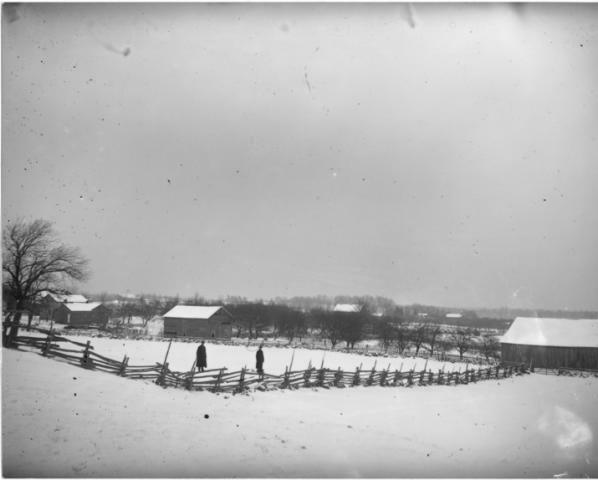 Winter Fences and Barns: Photo Courtesy of Archival Collections, McLaughlin Library, University of Guelph. Stephen Sylvester Main Collection. A preview of some of the environmental themes covered at the Canadian Historical Association meeting in June 2013, this panel shows how the unique character of rural spaces influenced processes of meaning-making and place-making. Rural history in Canada today is a lively field! Building on a long tradition of examining the relationships between people and place, historians have produced important studies in social, economic, and political history that reveal the complex lives, societies, and environments of rural Canadians—who, as recent research by Ruth Sandwell reveals, made up the majority of all Canadians until well into the post-war period. Canadian rural history has embraced a range of methodological approaches; however, cultural history has so far largely remained on the margins of the field. The papers in this panel place rural culture and cultural analyses at centre stage. In this contextcultural history refers to the study of rural cultural production, but also foregrounds analyses of meaning-making in rural settings more generally. How did rural people in the past make sense of the worlds around them? In what ways did rural environments contribute to the particularities of these experiences? How might historians conceptualize these processes today? Organized around the theme of vision, our papers historicize “acts of looking” in nineteenth-century Canada. In considering the ways that rural people saw the worlds around them and how they interpreted and made meaning from those sights/sites, this panel reveals how the unique character of rural spaces influenced processes of meaning-making and place-making, determining and at times defying how a range of historical actors envisioned “the rural.” The panel demonstrates some of the diverse scholarship that is possible from a cultural history perspective, drawing together analyses of representational, democratic, and embodied forms of vision. Jacqueline McIsaac discusses the relationships between rural culture, landscapes, and photography in her paper “Fragile and Focused: Glass Plate Photography and Perceptions of Rural Ontario’s Landscape, 1860-1920.” Arguing that understandings of rural landscapes as functional spaces influenced how these areas were photographed, this paper considers why certain environmental features were important enough to visually commemorate. Rural culture directed both camera use and what was photographed, allowing for photographers’ perceptions of and experiences with the countryside to be recorded. Here, acts of looking are culturally driven, but at the same time, indicate the multiple meanings of rural spaces. As photographs cannot help but reveal the visual priorities of the photographer, images of Ontario’s countryside depict the social values invested in rural landscapes and spaces. Many people still hold the misguided idea that rural life in the past was somehow simpler and more idyllic than our hectic twenty-first century existence. In “Envisioning a Rural Landscape: Settlers, Bureaucrats, and Land in Nineteenth-Century Ontario,” Derek Murray attempts to further dispel this myth by examining the highly-contested process of road building. Roads were essential to the functioning of rural communities. In the backwoods of Upper Canada, where the topography defied the logic of the grid, the placement and maintenance of roads was crucial not only for convenience, but for basic survival. Analyzing the process whereby settlers and the state negotiated road construction projects and envisioned the rural landscape, this paper reveals an emerging democratic culture in which frustration with bureaucracy mattered more to community formation than social status, religion, or ethnicity. Sara Spike’s paper, “Looking for the Blind: Locating Disability in the Late-Nineteenth-Century Rural Maritimes,” considers the invisibility of people who were blind or visually impaired in the historical record of rural communities. Using the rural extension program of the Halifax School for the Blind as a case-study, her paper considers the ways that the “illegibility” of rural communities may have contributed to alternative conceptualizations of disability. Practices such as occupational pluralism that defied normative models of productivity and independence also had an influence on definitions of ability. This challenged the imperatives of officials from the School for the Blind who wished to locate rural candidates for (re)education, and today it challenges historians who wish to study the experiences of people with visual impairments in rural communities in the past. With an interest in understanding rural difference from a cultural perspective, these papers contribute to a growing literature that positions rural as a category of analysis through which to register an understanding of Canadian society, thought, and culture. Jacqueline McIssac is a PhD Candidate at the University of Guelph, Derek Murray is a PhD Candidate at the University of Victoria, and Sara Spike is a PhD Candidate at Carleton University. R. W. Sandwell, “Notes Toward a History of Rural Canada, 1870-1940,” in Social Transformation in Rural Canada: Community, Cultures, and Collective Action, ed. John R. Parkins and Maureen G. Reed (Vancouver: UBC Press, 2012), 21–42.